The near-Earth asteroid 2012 LZ1, which is about the size of a city block, is seen as a circular white dot in this shot taken by a telescope in the Canary Islands on June 14, 2012. A newly discovered asteroid the size of a city block cruised past Earth well beyond the orbit of the moon Thursday night (June 14), providing a rare treat for scientists and telescope-equipped observers. The 1,650-foot-wide (500-meter) near-Earth asteroid 2012 LZ1 came within 3.3 million miles (5.3 million kilometers) of our planet during its closest approach at 8 p.m. EDT Thursday (0000 GMT Friday). Since that's about 14 times the distance between the Earth and the moon, the asteroid was never close enough to threaten Earth, or to be seen by most backyard skywatchers. But folks who stayed inside could get a good look on their computers. 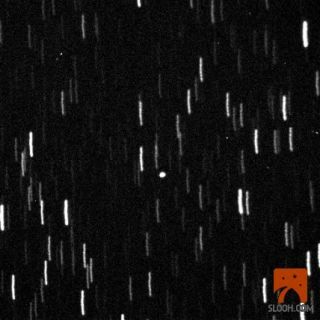 The Slooh Space Camera, an online observatory website, streamed live views of 2012 LZ1's flyby that were captured by a telescope in the Canary Islands, off the west coast of Africa. The asteroid didn't exactly streak off into deep space after sidling up next to us. It's moving somewhat parallel to our planet at the moment, researchers said, meaning that large telescopes should still be able to track it for the next week or so. Asteroid 2012 LZ1 came within about 3.3 million miles of Earth on June 13, 2012. Astronomers with Italy's Remanzacco Observatory captured imagery of the space rock, which is about 1,650 feet (500 meters) wide. Scientists are still taking 2012 LZ1's measure, for the space rock was just discovered this week. Astronomer Rob McNaught and his colleagues detected the asteroid on the night of June 10 and 11 using a telescope at Siding Spring Observatory, in the Australian state of New South Wales. While 2012 LZ1's size and proximity to Earth qualify it as a potentially hazardous asteroid, it doesn't appear to pose much of a threat to our planet anytime soon. "This particular one has no impact possibilities in the foreseeable future," said McNaught, who joined Astronomy magazine columnist Bob Berman on the Slooh webcast. But researchers will continue to watch 2012 LZ1 over the next few days, McNaught added, to try to map its motions out further into the future. This isn't the first time a relatively large asteroid has zoomed by Earth's cosmic neighborhood. Last November, the huge asteroid 2005 YU55 approached much closer to Earth than 2012 LZ1 when it buzzed the planet. Like 2012 LZ1, 2005 YU55 was the size of a city block. It passed inside the orbit of the moon, ultimately coming within 201,700 miles (324,600 km) of Earth before continuing on its way. It was the closest approach of such a large asteroid to Earth that was known in advance since 1976. The impact threat from this cloud of space rocks is real. Over its 4.5 billion-year history, Earth has been hit by asteroids repeatedly, including some that have wiped out large percentages of the planet's life forms. For example, the dinosaurs appear to have been done in by a 6-mile-wide (10-km) space rock that crashed into Earth 65 million years ago. McNaught is not alone in the search for near-Earth asteroids. NASA astronomers and scientists around the world regularly monitor the night sky for large asteroids that could pose a threat to our planet.